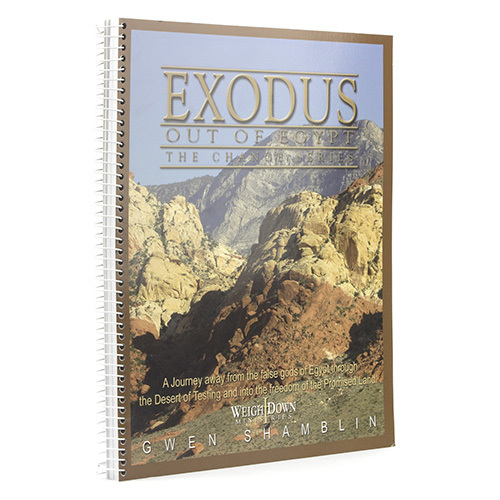 Exodus Out of Egypt (Change Series) Workbook with lesson summary, Scriptures, questions and charts to help you apply the video lessons available through WeighDown All Access! Select Your format - PDF Download for your computer/mobile/tablet devices or have a softback copy shipped to you. from Washington Answering the questions! This was my first class/workbook I took in 2006. I had abstained from sugar and flower for 5 years prior to this class. From this class I stepped out in faith and went back to eating sugar and flour. My weight was coming down from doing so. I honestly felt like it came more from answering the question's/looking up scriptures that I felt my weight come off cause it was so hard to believe I was enjoying ALL food inside hunger and fullness and my weight was going down. So grateful for these workbooks to help heal a hurting heart! !